Foodie Penpals. When new friends meet old friends. You know how it is when you throw a party and you have to decide who to invite? Do you invite every person you’ve ever known, only those who all know each other or a random mix? It’s always interesting when people from different spheres of your life meet. Sometimes it works (“wow – how come I’ve never met them before? They’re awesome!) and sometimes, it doesn’t (“umm I’m glad you like them, but I don’t get it…”). But whatever happens it is always interesting. 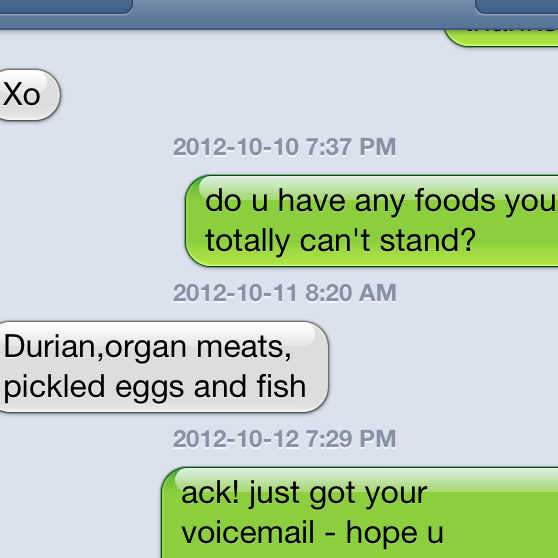 The Foodie Penpal program is a bit like that. You meet someone online, learn a bit about them, and you mail them a parcel based on what you have discovered in that brief encounter. Awesome. In case you’re a bit late to this particular party, the Foodie Penpal program is a fun monthly event started by Lindsay over at The Lean Green Bean. You simply sign up through her site, then on the 5th of the month you get your penpal pairing via email. 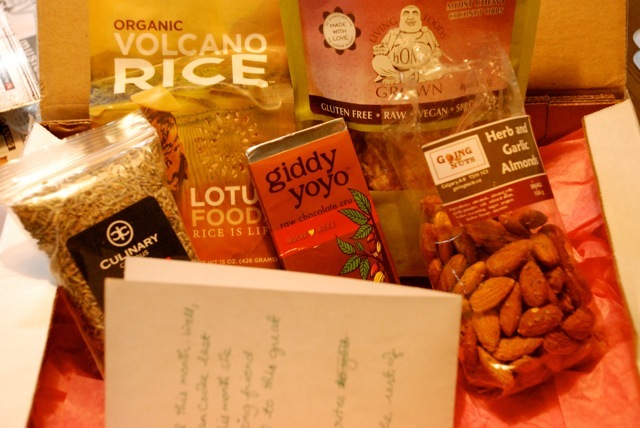 You send them a note, get all the information you might need (allergies, diet restrictions, address etc) and then put together a tasty package by the 15th of the month. Finally, on the last day of the month, if you’re a blogger, you post about the goodies you received from your penpal (Not a blogger? No worries. It’s open to sane people too). Other than a $15 maximum what you put in the parcel is up to you. The best part is is you get to meet two new people – the person you mail to and the person who mails to you. This month my penpal network of new friends expanded to include one of my old friends. Through a flukey mixup Srimanti,the same fabulous person who mailed me a parcel last month got matched up to mail to me again. Now don’t get me wrong I would happily have received another parcel from her (remember how great last months was? See here if you forgot.) but rather than do that we decided, for the fun of it, to surprise someone else with a package. So after a quick text message to an old friend of mine to confirm there was nothing food wise I didn’t know about her, I sent a note to Srimanti telling her a bit about my friend and left it up to her. New friend, meet old friend. And no durian or organ meat in sight. Thanks Srimanti for sending a smile to someone who constantly makes me smile. Great post Meg! Thanks again to Srimanti and you for the yummy surprise!